You know Hello! Project is getting too much attention, when a busy guy like me is creating 4 posts on a single day, and covering 5 news in two posts. ^_^ Not that it's forced upon me, but because things like this has to be historically documented somehow. In an exclusive interview with Oricon yesterday on the 23rd, members of GAM, Matsuura Aya and Fujimoto Miki talked about their first album "Amai Yuuwaku" ~ "1stGAM～甘い誘惑" which was launched on the same day. The interview started off by mentioning Hello! Project caters to different listeners to their own age. Ayaya noted that because their busy schedules, the pair have to do their recording on different sessions and in order to do so they each have to imagine each other's presence. But given their long time friendship, their chemistry provided for great teamwork and have completed their recording without major problems. For example, when Ayaya sings the chorus, she is able to envision Mikitty's voice and singing style in her head to provide her part. 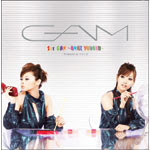 The pair stated that they owed their rapport and chemistry to them knowing each other since their solo career days even though they have formed GAM only a short while ago. Therefore Ayaya and Mikitty exclaimed that the theme for GAM is "Freedom". The pair wished to show the fans the GAM that they have created on their live concert, and is confident that they will enliven the crowd to sing along. Friday reveals news of the two leaving a sauna, and having a 3-day-long date. Both are seen entering Shouji's 4WD car, going for a 2-hour-long dinner to a Japanese-style dining bar, then stopping at Miki's apartment and leaving in less than one hour for a sauna salon. Just after midnight, they are seen going back to Shouji's apartment. Is this the end of Mikitty? Are we witnessing the shortest reign of being leader of Morning Musume at only 3 weeks? How will UFA handle this situation given the recent trouble caused by Kago Ai and Tsuji Nozomi? Busy with work, that is. Satoda Mai have been receiving numerous praises of being a wonderful TV talent. Other than her pioneering a new futsal league back her hometown, Satoda have been increasingly active in her "solo career" as sole member of Country Musume. Her activeness on variety shows and the like is only second to Nakazawa Yuuko. Even Yaguchi Mari is getting less appearances, but then again she has her own radio show and a regular show. Satoda Mai have a solo single released, entitled "Oyaji no Kokoro ni Tomotta Chiisana Hi". Or rather a duet really, as reported in BARKS. The single will also feature the participation of veteran duo "Fujioka Fujimaki", whom have their own show called Oyaji Entertainment. I don't think this single is aiming at the top of the charts, but it's meant to be fun. Some Boys! Blog noted this news and provided a sample, please buy it if you like it. In addition to that, Satoda gets her own regular column in B.L.T. magazine, named "Satoda My Favorite" starting today. ALSO, she will be next featured on Hello! Project Digital Books for the month of June. Yup, ANOTHER photo album eyecandy for us. I'm so happy she's getting something to do now. I've always thought she was awesome. I don't think H!P can afford to lose Miki. Miki is very popular for many good years. From her solo to MM. I'm all the way for YAM!